Do you fancy a sweet or savory snack? Than your at the right place in Amsterdam, one tip: don’t think about those nasty calories… You’re on holiday! 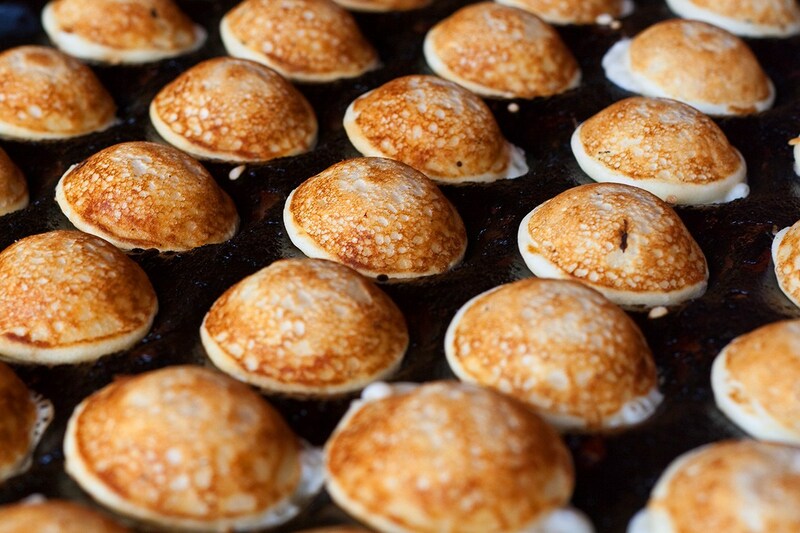 Poffertjes are a sweet pastery dish, it’s best comparible with pancakes, but smaller and thicker. They are made from wheat flower or buckwheat flower. You can eat it with dairy butter, syrup and/or icing sugar. You can order them in restaurants or order them from a street vendor. The poffertjes bakers are very skilled at turning the poffertjes around very quickly. Appeltaart or Apple pie is known for its wide variety of different recipes. Besides the basic ingredients, dough and apples, different ingredients can be added like raisins, currants, cinnamon and to top it off whipped cream is added beside or on top of the appeltaart. The first recipe of the Dutch appeltaart is mentioned in a cooking book from 1514, a cup of coffee with a warm appeltaart is the Dutch way to go. You can order a appeltaart in almost every restaurant. You can’t eat a tompoes without getting your hands dirty. It’s a typical Dutch pastry made out of two layers of French pastry, with a thick layer of vanilla custard between the layers. On top of the pastry you will find a little pink layer of glaze, which is orange during the national holiday Koningsdag (King’s Day). You can get a tompoes at bakeries or supermarkets. The Dutch love their cookies and one cookie they eat alot of is the stroopwafel. It’s a round thin waffle with caramel syrup in between. Stroofwafels are sold in the street, the super markets and in bakeries. You can get them in different sizes from small to big. When you buy a stroopwafel from a street vendor, you can eat them warm. If you want to go the Dutch way, break bits of pieces of the cookie off and eat it this way. Fancy a big snack? Try a rookworst! It’s a traditional Dutch recipe which is made of grinded meat (pork, beef or a mix of both), mixed with spices and salt which are than put in a natural casing. On average the Dutch eat about six a year. After the sausages are dried they are put in a smokebox. Rookworst translates to smoked sausage. A typical Dutch things to do is to get a rookworst at the HEMA (Dutch small department store). As an evening meal Rookworsten are typically eaten with ‘stamppot’ (a mash of potatoes and a vegetable kind). Drop is a Dutch liquorice which is sold almost everywhere in The Netherlands in many different sizes and shapes. You can get them in basicly two tastes: salty and sweet licorice. So if you want to act Dutch, drag your bag of ‘Drop’ with you every where you go and share them with your friends. The kroket is a deep fried roll with meat inside of it and bread crumbs on the outside. On average the Dutch eat about 25 ‘kroketten’ a year per person. You can get a kroket at a snack bar or out of the wall! Febo is a widely known Dutch snack bar and is located in different locations in The Netherlands, here you can get a kroket out of the wall. It works like a vending machine, you can put a coin besides the desired snack, the little door will unlock and you can get your snack. The kroket is available in different kinds like a sate kroket, a vegetable kroket or a goulash kroket. You can eat them with a bun and you could get a McKroket at the McDonald’s. Everywhere in Amsterdam you can get different kinds of cheese, ons of the most famous Dutch cheeses is Gouda kaas. Did you know that 10 litters of milk will give you one kilogram of cheese? The Dutch eat their cheese mostly on bread, but they also like to serve it in little pieces when they have visitors or in the bar with a glass of wine. On average the Dutch eat about 14,6 kilo’s of cheese per person per year. You can get cheese almost everywhere in holland, go to a cheese vendor to get some advice and find out which cheese is the right cheese for you or you could try a sandwich with cheese ‘broodje kaas’, it’s sometimes served with mustard. Oliebollen translates to oil balls. It’s a traditional yeast dough dish from the lowlands, you can get them with or without raisins. Traditionally they are eaten on New Year’s Eve, but they are also sold on temporary fairgrounds in The Netherlands. The Bitterbal is a small deep fried meat ragout ball, it’s mostly eaten with parties and in the bars as a cocktail snack. Literally translated the bitterbal means bitter ball, but it’s not actually bitter, but the snack was eaten with a herbal drink.